Hands up if you have noticed that English paper piecing is everywhere right now? The ‘hexie’ craze is taking over, and I love it! I can’t stop making them! 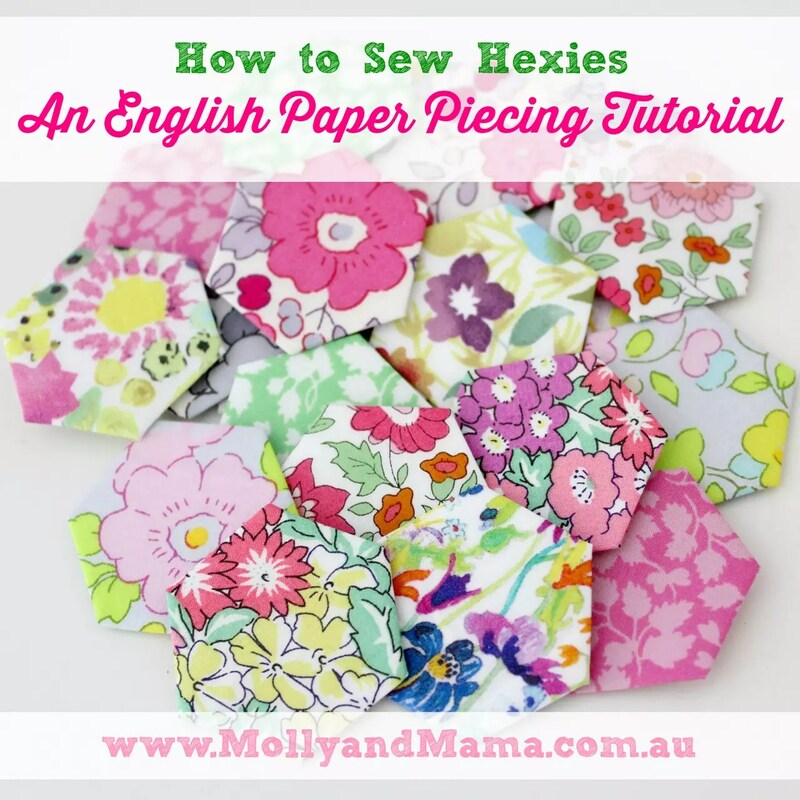 Hexagons (which are affectionately referred to as hexies) are made using a process called English paper piecing (or EPP). Each hexagon is made individually, by wrapping a fabric hexagon around a paper shape. And then the shapes are stitched together to form a new ‘fabric’. 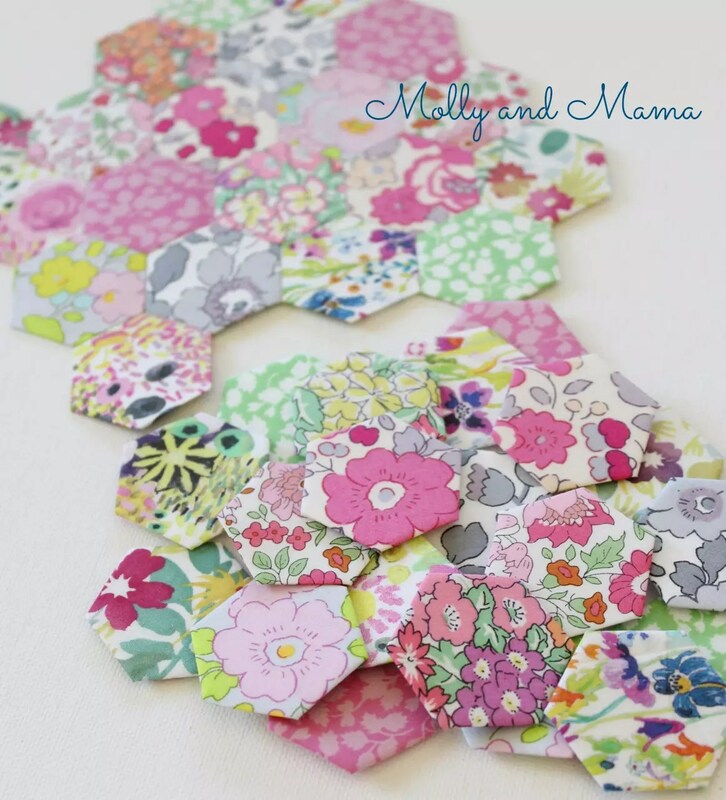 Hexies can be used alone to create lovely patterns and shapes like flowers. You can also use other shapes like triangles, squares, diamonds, jewels, kites, elongated hexagons and half hexagons. The shapes can tessellate together in endless combinations to create truly beautiful designs. But if you’re just getting started, then hexagons are a nice easy introduction. 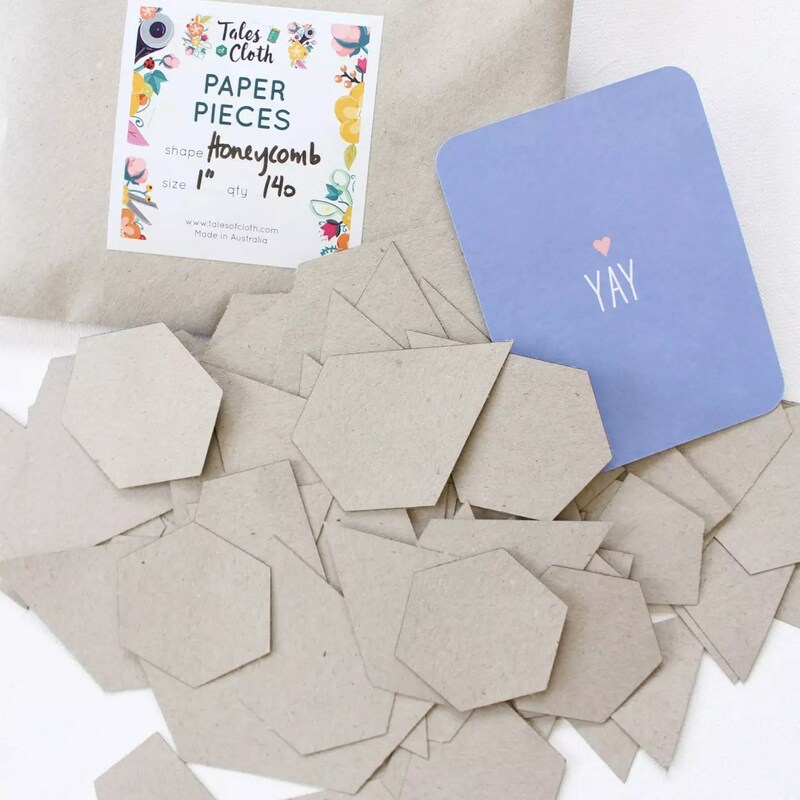 Hexagon shaped papers. Hexagons are measured by the length of their sides. 1” side hexagons are a great place to start. I love cutting hexagon papers using light card and my Sizzix Big Shot Plus machine. 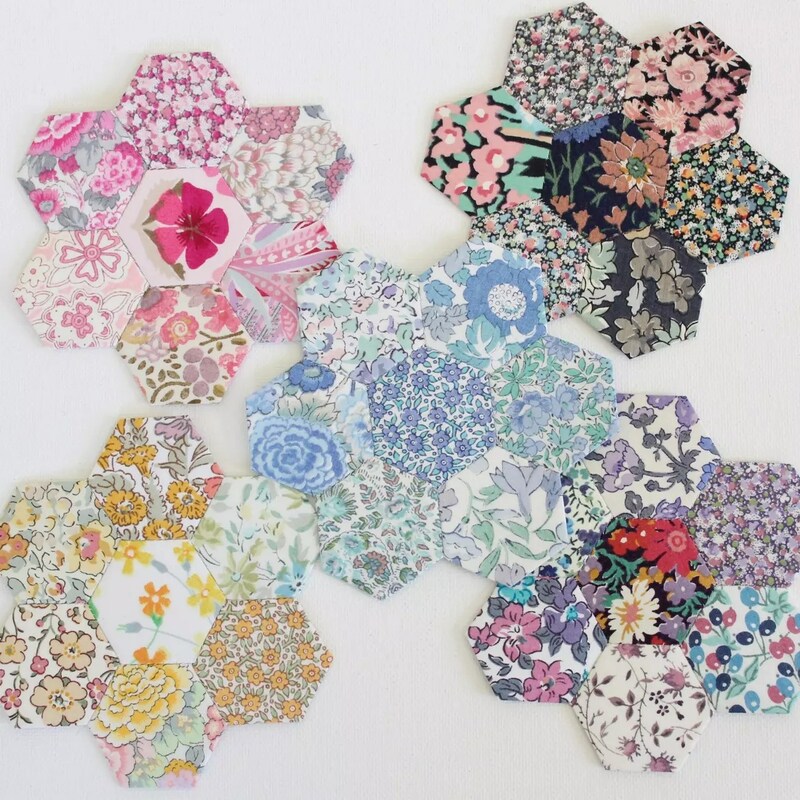 You can purchase die shapes to cut both hexagon papers and fabric too. A great time saver! 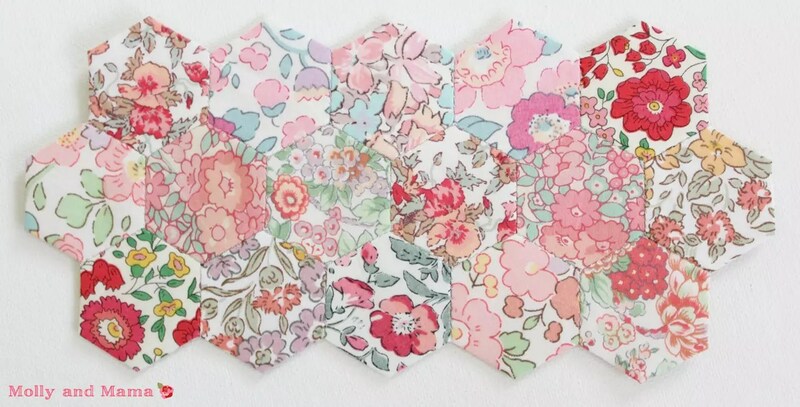 You can also cut out your own hexagons or other shapes for English paper piecing, using printed templates. I also like to purchase paper shapes in bulk, from great patchwork or quilting stores, or from online suppliers like Tales of Cloth. Wherever your EPP shapes come from, the key here is accuracy. You really need to the shapes and their sides to be uniform so that they fit together nicely. Sewline Glue Pen. You can baste your fabric to your paper with needle and thread, but I really prefer glue basting. Some people use an everyday glue stick, but I like to use a Sewline glue pen, with glue specially formulated for EPP. You can use the pen to add a small thin layer of glue to secure your fabric. It’s strong enough to hold the fabric in place, but also easy to remove after stitching your hexagons together. And it’s so much quicker than sew basting. Fine embroidery needle and thread to stitch the hexagons together. I use a milliner’s needle in Size 9, and 60 weight polyester thread (known as bobbin thread) to sew with. Fabric for your hexagons. Quilter’s cotton is ideal. But I have also used fabric as fine as lawn. You can use a couple of different prints or a huge range. It’s up to you. Using the glue pen, run a small amount of glue along the edge of one side of the hexagon paper (being careful not to use too much glue, or to glue too close to the edge of the paper). Fold the fabric over firmly and secure. Repeat this process to fold over all 6 sides of the fabric. Be especially careful to keep the fabric folded firmly near the points or corners. Your completed hexagons will look like this. Repeat this process until you have made the quantity of hexagons required for your project. Lay out your hexagons in a balanced arrangement, just like you would with patchwork. 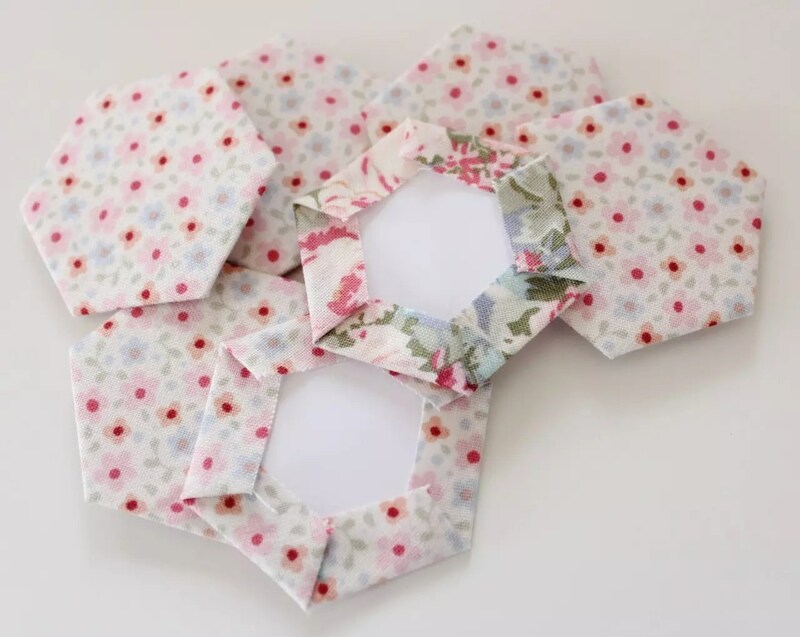 You can choose to make flower shapes where six hexagons are sewn around a central hexagon. Or you can join the hexagons in rows to create a large square or rectangle shape. This can then be used for the centre of a quilt. Here’s how to put them together! Stitching the hexagons together is the time consuming part of the process. But the effect at the end is well worth the effort! Photograph your arrangement if you wish, so that you can refer to it as you sew. Choose two hexagons, and identify the sides to be joined. Hold them right sides together, being sure to line up the edges and corners of the side you wish to sew. Thread your fine embroidery needle with a single strand of fine thread (choose a colour that will blend nicely) and knot one end. Use very fine, and small, whip stitches to sew the two sides of the hexagons together, starting at one corner and stitching along the edge to the next corner. When you start, sew a couple of stitches in the same place, to secure the start of your stitching. As you stitch, catch 2 – 3 threads from the folded edge of both pieces of fabric, being careful not to stitch through the actual paper. Small, closely spaced stitches sewn straight across the fabric top are best. When one edge is sewn, secure your stitching with a couple of stitches repeated in the same place, at the end of your hexagon side. This keeps the stitches tight and the seams (for each side of the hexagon) neatly intact. Next, fold the hexagons out flat and identify the next hexagon to be added to the design. Repeat the method as described above to join all the hexagons together. You will find that you can join many sides together with one single strand of thread, if you sew them continuously. You can also run your needle and thread up the back of the seam stitches (on the wrong side of the hexagon) to move the thread to another spot to start stitching a new seam. But at times, the only option will be to secure your stitching with a few back stitches on the wrong side of your hexagon, and cut your thread. Then start your sewing again at a new place. 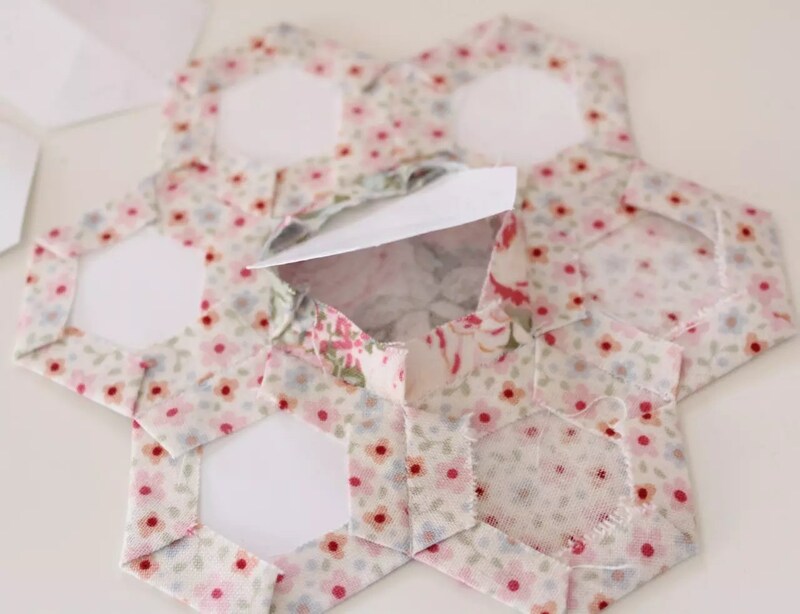 You’ll discover you need to fold the paper hexagons at various times in order to stitch certain sides together. It can be a fiddly process, but the finished effect is lovely! When all the sides in the interior of your chosen design are sewn together, you can begin removing the papers. Remove the papers from the centre of the design first and then work your way out to the edges. 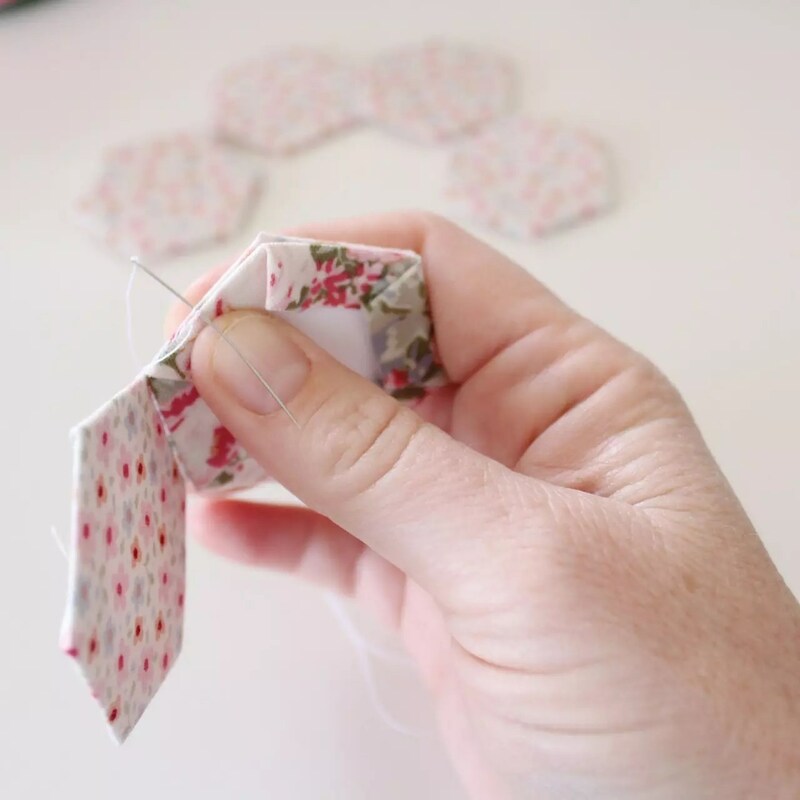 Carefully remove the papers by lifting up the fabric on one side of the back of the hexagon and sliding your finger along to tease the fabric from the glue. When you find the corner of the paper, you can carefully manoeuvre the rest of the paper out. You may like to press the back of each hexie with a warm iron as you go. This will help the hexagons retain their shape. 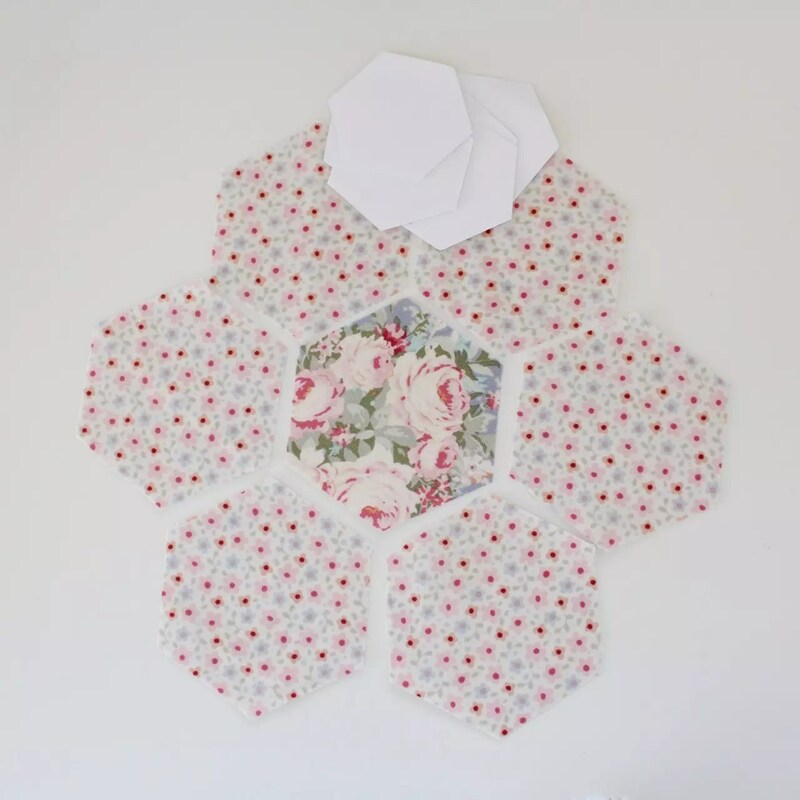 When finished, you will have a hexagon design that can then be used as a panel for patchwork, or as an appliqué shape for a pretty quilt design. Once you’ve made a few hexies, you won’t be able to stop. 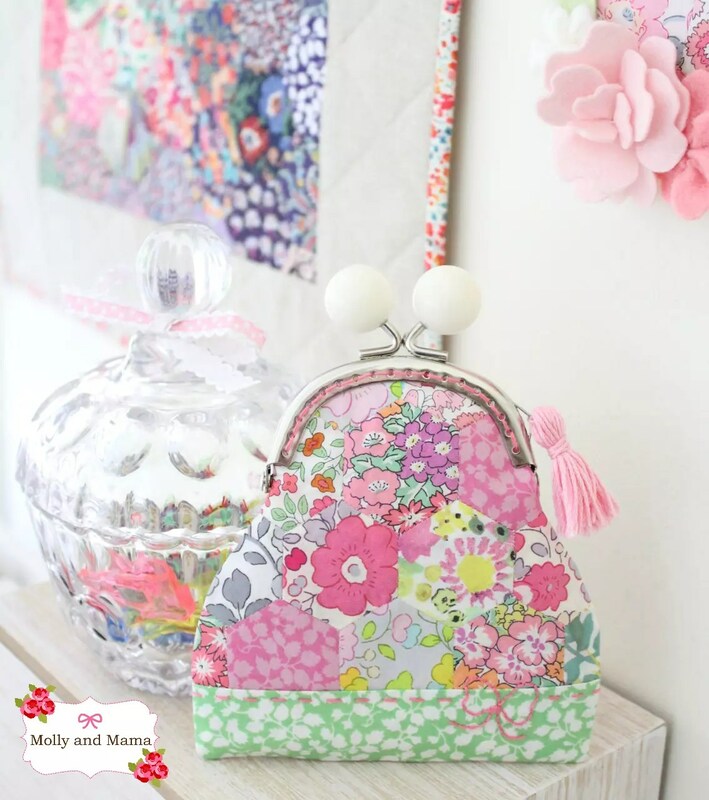 You might like to have a go sewing the Pretty Penny Coin Purse using my free tutorial you can find HERE. It’s such a sweet project! Or you can move onto sewing other shapes together and making beautifully intricate designs. You’re only limited by your imagination. 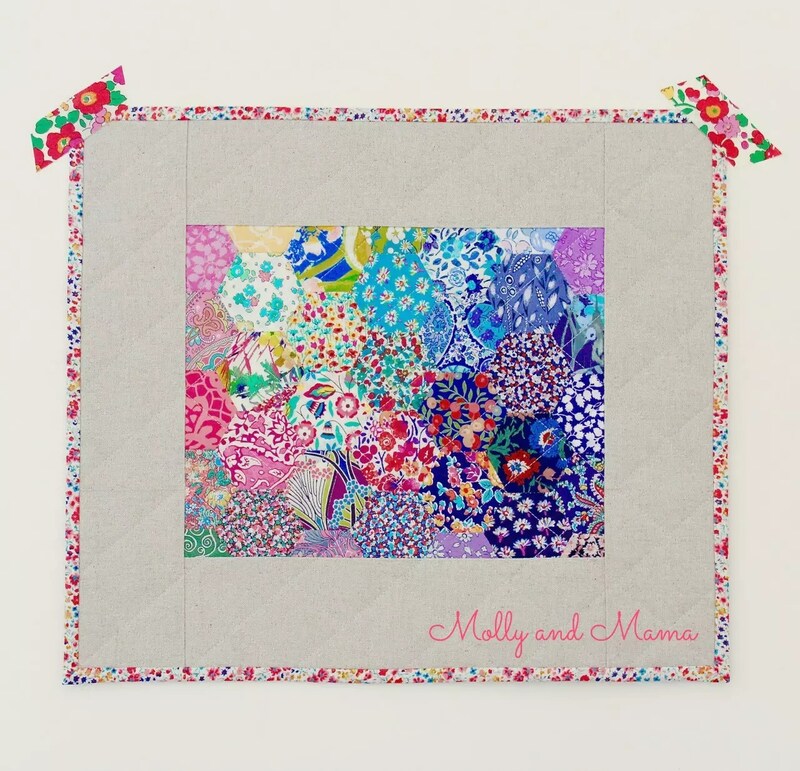 Head to Pinterest for lots of beautiful English paper piecing and quilting ideas. Instagram is also a great place to go for inspiration. Search the hashtags #hexies, #hexagons or #englishpaperpiecing. 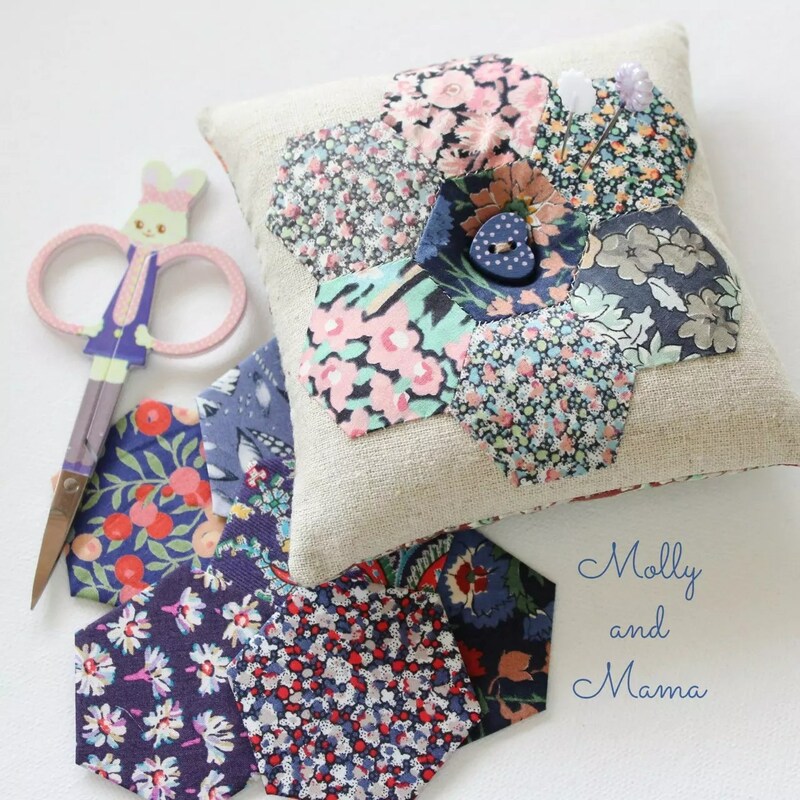 Be sure to show off your hand pieced sewing on the Molly and Mama facebook page too. I hope you’ve found this tutorial helpful. If you’ve got a tip to share, feel free to leave a comment. Great tutorial and such pretty photos! I find that thread basting works better for me when I take my hexies on the road, and don’t have a flat surface to use for gluing. That’s a really great tip Michelle. Thanks for sharing! You mentioned using lawn for the hexies. I received a bundle of Liberty lawn fat quarters for Christmas. I’d like some pointers on how to use this fine, light fabric. Can you get me going in the right direction. Love your hexies, such a variety of fabrics. Hi Gail, Hooray for your new Liberty! I use lawn just like other fabric. In fact, I prefer to sew hexies with lawn over quilting cotton. I use the same method explained in this tutorial. I find it really easy to sew, just keep your stitches very small and fine. Have fun! I see that most of the hexies shown are applied to something, rather than standing alone. While this discussion has been about the hexies, does the lawn get used in other ways in piecing? It seems so light and fine that using it for larger pieces might be a strain on the fabric. And adding quilting, again a strain. Can you comment , please. Thanks. I’ve used hexies to adorn other projects like pin cushions, so I have backed the hexie panel with fusible interfacing for added strength. But I have done this to strengthen quilting cotton too. I have also used hexies for larger quilts and I love the look and feel of the finished product. Lawn is easy to hand quilt too. I think the only way to really understand how the fabric will respond to English paper piecing or other piecing, is to give it a go yourself. There are lots of beautiful lawn quilts that have been hand pieced and quilted out there. Please have a look at avaandneve.com.au, http://www.lilabellelanecreations.com and http://www.cuttingcloth.com.au. Their instagram feeds are very inspiring! Thank you for your responses, Lauren. I will check out the websites. And give the lawn a whirl. You’ve been very helpful.